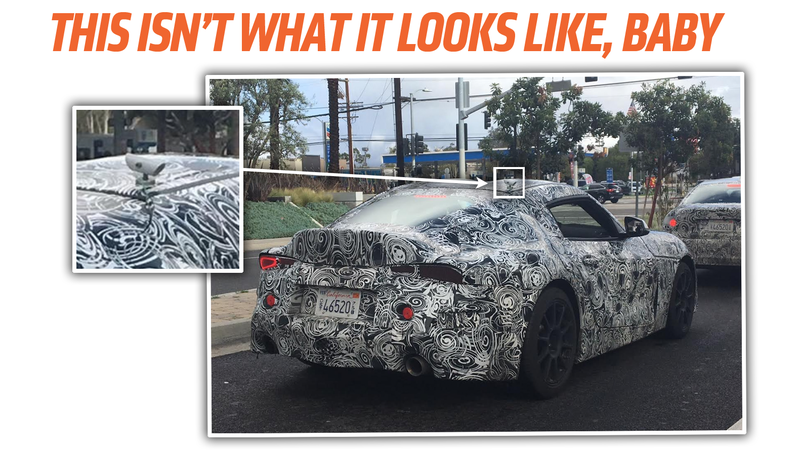 If you’re one of our few regular readers who doesn’t get blackout drunk on fuel injector cleaner every night, then it’s possible you’ll remember these pictures of what appears to be the new Toyota Supra in prototype disguise. You also may recall that we pointed out something that appeared to be a small camera. It wasn’t. But now we know what they are. Now, initially, we thought this was some sort of small camera, possibly used for testing lane departure systems, or perhaps some sort of assisted driving technology. I was just guessing. I did a bit of looking around and, yep, you see these things on a number of disguised prototype cars. So, now you won’t be fooled! Those aren’t cameras taking video, they’re thermocouples taking the temperature of the air, very carefully, since, unlike people, air lacks mouths or anuses or armpits into which you can shove a thermometer.